Increasingly, consumers are engaging brands via multiple digital touchpoints. These interactions experienced through texting, phone apps, websites and social media are essential to business growth and profitability. Companies capable of optimizing digital experiences will be well positioned for the long haul. Industry analysts are seeing a resurgence of projects and investments in flexible technologies that have reliably demonstrated an ability to help generate sales, save money, improve loyalty, or solve customer service problems. Chief among them are integrated digital experience strategies. Many businesses are finding the potential of consistent, cross-media digital experiences elusive. Charged with the responsibility to deliver websites, mobile apps, and in-store systems — all supporting digital experience initiatives, IT executives are discovering that they simply do not have all of the technologies they need. In their search for a silver bullet, some have fallen for the promise that a single-vendor solution can solve their woes. Sadly, one size does not fit all. In a world where legacy technology is not going to magically disappear, best-of-breed point solutions coupled to a flexible integration strategy make more sense than ever. All too often companies make the mistake of overinvesting in features and underinvesting in integration. Even when CIOs truly “own” the platform, integration among the many possible touchpoints, operational, and back-end systems, remains a sore point. The problem is that new touchpoints crop up on a regular basis and hard-wired, custom integrations make accommodating new channels difficult. A flexible integration strategy and execution plan must serve as the cornerstone of your digital experience platform. While “integration” may not be the term that marketing or even digital experience leaders use, these stakeholders are nonetheless familiar with the pain points that prevent their teams from working across the aisle. Integration is the key. Ease of integration and alignment with architectural strategy should be key selection factors when choosing the technology components for your digital experience platform. Are the systems that I need (CMS, commerce, product ordering, etc.) modular and extensible? Or are they packaged suites that lock in features that are not core to the offering? Can I extend legacy systems through reusable services and APIs? Or am I looking at a total rip and replace? Is this solution truly best-of-breed? Can I deploy the solution alongside existing systems, and then adjust business unit workflows gradually to deliver an organizational-wide digital experience platform? Is integration based on flexible technology that I can bring in-house if I choose? Is it flexible enough so that I can swap out proprietary components for open source capabilities if needed? How locked in am I? Can the solution integrator or service provider guarantee predictable outcomes? Do they have a solid track record with verifiable references? Do they automate or codify best practices? Without a flexible integration strategy, one or more of your channels is going to be left hanging either today, or tomorrow. Make sure that does not happen by anticipating change right from the start. 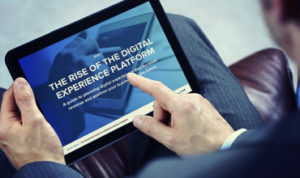 To learn more about integration and other challenges you may encounter in your digital experience initiatives, download the ebook, The Rise of the Digital Experience Platform.